Over the last couple weeks I've been compiling information for our taxes so I can find out where we currently stand. We're most likely going to end up dropping down to the 15% income tax bracket this year which means taxes on dividends and long term capital gains drops to 0%. 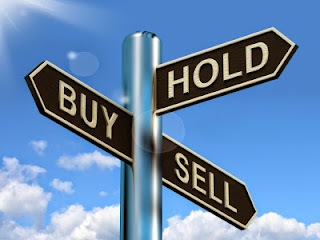 Since this is likely to be a rare situation that we find ourselves in I've been reexamining our portfolio to look for what positions might need to be culled through outright sale or which ones I might want to try and step up my cost basis on by selling and repurchasing the shares. The yield on cost would get messed up but the current yield would stay the same so there'd be no loss in dividend income. One company that I'd targeted as a candidate to remove from my portfolio was Baxter International (BAX). Earlier this year Baxter spun off Baxalta, it's bioscience arm, which changed the makeup of the company. Not only that but the combined dividend from the two companies was reduced by over 60%. 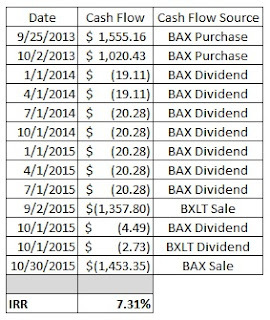 I already sold my Baxalta stake earlier this year and with our taxes due on gains being zero I decided to close my Baxter holding this past Friday for $37.47 per share. I had two lots of Baxter shares for a total ownership of 39 shares. One lot of 23 shares had a total cost basis of $858.92 and the other was 16 shares with a cost basis of $563.59 with a total cost basis for the position of $1,422.51. Total proceeds from the sale, after commissions, came to $1,453.35. That's just a 2.17% return for the two years that I held the position, excluding dividends. However, we have to remember that when I purchased the shares the company was one but they had since split in two different companies so to get an accurate reflection of the return we need to include both companies in the calculation. The combined cost basis was $2,575.59 and the total proceeds from both sales came to $2,811.15. The return looks a bit more palatable at 9.15%. Although there's a big factor missing: dividends. I received 9 dividend payments over that time totaling $146.84 so the total return works out to 14.85%. Still nothing spectacular but a profit is a profit. To really see how well, or poor, I did you have to take into account the timing of the purchases. After all 14.85% return would be great for a one or two year period but pretty poor for ten years. That's where Excel's XIRR function comes in handy. I'm not going to rehash how to use the XIRR function but if you're unsure you can check out this post. The following chart shows the cash flows for the combined position. While my total return worked out to 14.85% my internal rate of return, which accounts for the all important time factor, came to 7.31%. A solid return and nothing to complain about. The reason I sold my stake in Baxter is largely due to the combined dividend being reduced. Although in all honesty I would have been fine with that but the future returns don't look all that spectacular. I go into more detail here about the future returns but there's potential for the returns to only work out to 2-3% per year over the next 3 1/4 years. Given the dividend reduction, 0% capital gain tax for this year, and uncertain medium term I decided to part ways with my Baxter holding. Although I wouldn't be opposed to re-initiating a position after a couple years when there's more information on how the company is performing. Have you made any sales to clean up your portfolio? What companies should be on my radar to invest this capital in? Hi PIP -- I'm in the process of cleaning up my portfolio. Your post is timely, because you're considering several factors I haven't thought about... I particularly like your total return calculation taking the time of purchases into account. 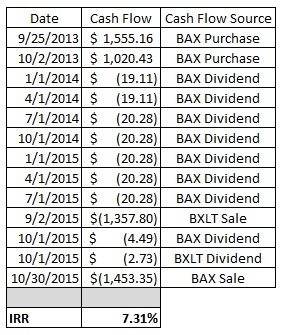 BTW, I sold BAX and BXLT earlier this year because of the dividend cut. I'm still looking at a few other positions to try and play the tax game with so there could be more changes later this year. I liked the combined company more than I liked the separate ones but BAX's management has been excellent at creating value for shareholders over the long run. That's why I'm still keeping my options open for repurchasing shares if the valuation and company outlook is favorable over the next year or two. I love the healthcare sector and want to add more of it to my portfolio. I'm in the process of cleaning up our portfolio as well. I think your decision to sell BAX is a great one based on your reasons listed. It's important to always be looking for opportunities to improve. Given the change in the company makeup, reduced dividend, and lackluster future returns I'm happy to sell and take my capital elsewhere. Although BAX will still be an option once I see how they do as a separate entity. Makes plenty sense to me. The adverse change in the dividend is really disappointing. I continue to hold in hopes that big dividend growth gets things back on track, but we'll see. If I don't see huge dividend raises by both firms over the next year, I'll have to move on. But I still really like the underlying businesses and their future prospects. There's 3 big reasons that prompted me to make this change. (1) the reduced dividend (2) 0% LTCG (3) where are the returns coming from going forward? It's a shame because I really liked the combined company but as they stand now the business has changed. I think I'd be foolish to not take advantage of the 0% LTCG this year and BAX was a great opportunity to do so because the yield is so small now and the DG going forward might not make up for it. Typically with a 1-2% yield I'm expecting at least 12-15% DG and I don't think BAX can deliver that. I like the future as well and once we get a clearer signal from management I could see myself owning BAX again, probably not BXLT though. I have to say that I kind of enjoy reading the 'recent sell' posts among the DGI community because they are so rare. 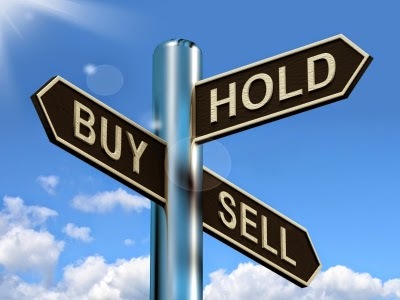 I always wonder what reason a person has for selling as we all invest for the long term and are buying, ideally, for a multi-decade holding time. Your reasoning for this portfolio 'clean up' is understandable. After all, if dividends disappoint then what's the real reason for owning a particular stock when you are investing for those dividends in the first place. Yeah I think the sale posts are more enlightening as well. There's not too many times I come across a buy piece that really makes me think especially now after several years under my belt and my own process that I've found works for me. But the sale articles offer more insight to things like why the thesis was wrong or something they missed in the original analysis or what changed that is now a cause for concern. If I was fairly confident the dividend would be able to grow even 10% for the next 5-7 years I might have held on but the reduced dividend and now 1% yield with likely high single digit growth over that time just makes it less compelling of an investment now. Especially since it doesn't look like I'll make up for it through capital gains because the valuation is pretty high right now as well.